The NASA-Hollywood Bromance, Mens Journal\n\n\"Of course, not every film gets approval. You won't see any official NASA logos in Life, for example, about a martian life-form terrorizing the space-station crew. \"It is not the kind of story that we wanted to tell,\" says [Bert] Ulrich. 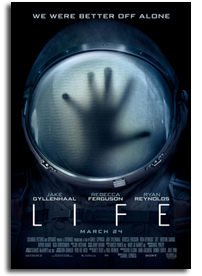 NASA's general policy is that a film needs to have a NASA story line in it, with clear value to the agency.\"\n\nLife Movie Clip Has Ryan Reynolds & Crew Against an Alien Attack, MovieWeb\n\n\"Sony Pictures released this clip online and it gives us our first very good look at the terrifying, yet unassuming looking alien that will be terrorizing the suspiciously good-looking crew of astronauts in Life. In the video, we get to see the first ... The clip is super tense and doesn't give away too much, but definitely shows us that this exciting and groundbreaking discovery won't be all peaches and roses. It might actually result in lots of dead astronauts.\"
This page contains a single entry by Keith Cowing published on March 10, 2017 8:45 PM. The Alabama Mafia Wants All Rocket Engines Built In Alabama Forever was the previous entry in this blog. Old Thinking About New Directions Inside and Outside of NASA is the next entry in this blog.